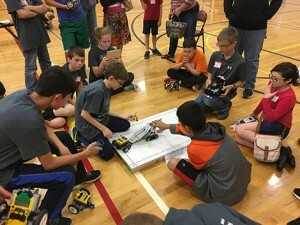 Emporia Middle School hosted a LEGO Robotics Meet May 9, with teams from EMS, Burlington, Olpe, Kaw Valley, and Hartford competing. In individual events, the EMS team of Connor Hauff and Caleb Hollenbeck placed first overall with 34 points. They placed first in the Ratio Run and second in the 25-Foot and 100-Foot Raced. EMS students Isaac Moore and Noah Weidner tied for second place overall with a score of 20 points. They placed second in the Ratio Run and Capture the Flag competitions and fifth in the Maze. Kaw Valley students Kaylee Lukert, Katelyn Hurla, and Connor Biswell also tied for second place, with a first place in the 100-Foot Race and fourth place in the Ratio Run and Push competitions. Caleb Schmid from EMS placed 4th overall with 15 points. He placed first in Capture the Flag and fourth in the 100-Foot Race. In the Capture the Flag Tournament, Burlington students Kurt Keegan took first place and Trevin Myers placed first and second, respectively; EMS students Isaac Moore and Noah Weidner placed third while Michael Shi was fourth. Finishing in fifth place was Wyatt Wilson from Burlington. 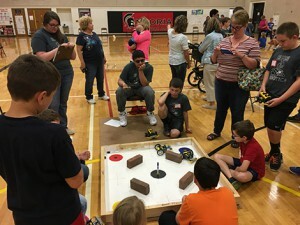 Burlington’s Tristan Kelley placed first in the Sumobot Tournament. Hartford students swept the next four places – Tyler Stuck was second, Aiden Goodman third, and A.J. Navarro fourth. Jed Cole of Hartford tied Olpe student Connor Kueser for fifth place.